APEX gaming to launch iDROP at G2E Vegas – APEX pro gaming a.s.
iDROP is the answer at live tables – namely how to manage ticket-in, ticket-out and ensure complete, secure, real-time accounting. The iDROP is mounted into the gaming table. Fitted with an easy-to-use touchscreen display, croupiers can accept tickets directly at the live table and exchange these for chips / jetons. Players decide themselves whether to exchange the complete amount on the ticket for chips. When a part amount is to be exchanged, the remainder is returned in ticket format. Naturally players can cash-in their chips for a ticket. This is all done by the iDROP. Operators have the further benefit of knowing the iDROP content in real-time. Thus, operators have immediate feedback on the drop. The iDROP will be joined by the iDROPe at the G2E Las Vegas. This solves the question of fitting the iDROP without having to make any major adjustments to the gaming table. It is an external device (which explains the letter ‘e’ – from the word external). It can simply be added-on to the table. 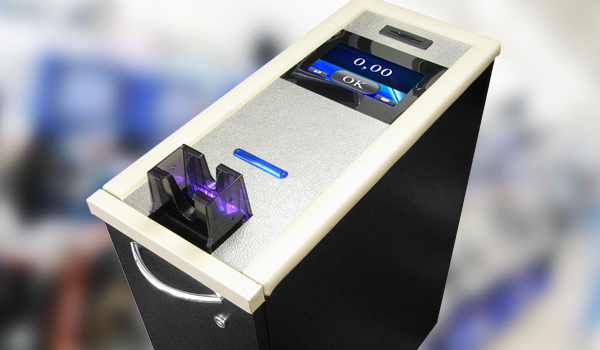 Just like the iDROP, croupiers can enter notes or tickets in a bundle of up to 50 at a time and print out a ticket. In addition to this, the iDROP and the iDROPe both have player tracking capabilities. The player card can be entered into the new slot on the iDROP/iDROPe and players can profit from the casino player tracking scheme and naturally operators can make great use of this new data from the live gaming area. The iDROP completes the product range that include the PINNACLE gaming machines, EVO gaming platform, APEX MOBILE SLOTS mobile gaming and the APEX PLAYER STATION automated multiplayer. APEX gaming offers both the slant-top and upright cabinets – as the PINNACLE SL and the PINNACLE. The Pinnacle SL is equipped with two 27” wide-screen monitors whereby the upright version has two 24” monitors. The EVO platform ensures pin-sharp games graphics on the screens. Once chosen, the game appears instantly – the player does not have to wait for the game to be loaded (solving one of the most important challenges for multi-game content). APEX gaming offers an extensive range of games, including 3D games that come to life thanks to the EVO platform. The APEX PLAYER STATION (APS) is the automated multiplayer from APEX gaming, equipped with eight gaming terminals, each with a 24” screen. This fully automatic player station incorporates a roulette wheel. APS also offers Sic-Bo, Baccarat, Black Jack and Quikker. Quikker is an APEX game where the player bets on the outcome of two cards – in a way this game marries the best of roulette with black jack, yet the odds are much higher. APS is extremely flexible – the slots gaming can be played on the APS – and APS games on Pinnacle gaming machines. Furthermore, the APS can be connected to up to three more roulette tables – in such a case the player can choose to play on four different roulette tables (automated or live). APEX MOBILE SLOTS rounds off the APEX gaming solutions. Here operators can offer APEX games on a tablet that is connected with the APEX slots or APEX APS. On busy nights when the casino is full, players who would normally have to wait for a free slot or table can then join in the gaming entertainment – thanks to APEX MOBILE SLOTS. “We are very excited about the forthcoming G2E Las Vegas”, enthuses Mr. Max Pessnegger, CEO of APEX gaming. “We will have the most complete, most innovative array of gaming solutions ever. Now we have the iDROPe to compliment the iDROP. Our games have really come to life on the Pinnacle cabinets with our EVO platform. The APS multiplayer is very stylish and our mobile solutions give operators more choice on the gaming floor”. The APEX gaming stand number at the G2E Las Vegas is #2867. The APEX team – including Johannes Weissengruber (Chairman), Max Pessnegger (CEO) and Kubilay Özer (Global Sales Director) – is looking forward to greeting visitors to the APEX stand.